Expert chefs will take you on a tour of the iconic Boqueria Market to choose the freshest produce which you'll use to make some delicious tapas. You're creations will be paired with the finest Catalan wines while you enjoy matchless views of Barcelona. Our expert chefs will take you to the Boqueria Market to pick the freshest produce for the mouthwatering menu you're going to create. You'll enjoy matchless views of La Rambla accompanied by the finest wines. Workshop 1: Spanish cookery class : During the workshop, you'll learn all the techniques and tricks of the trade that will help you make the following dishes: Gazpacho andaluz (chilled tomato soup), Spanish omelette with tomato-rubbed bread, Paella, Crema catalana (Catalan crème brûlée). Workshop 2: Tapas and Catalan wines: During the workshop you'll learn the techniques and tricks of the trade that will help you make tapas,including typical cod fritters or "surf and turf" meatballs. Guided tour of the Boqueria Market (except Taller 1 afternoon). 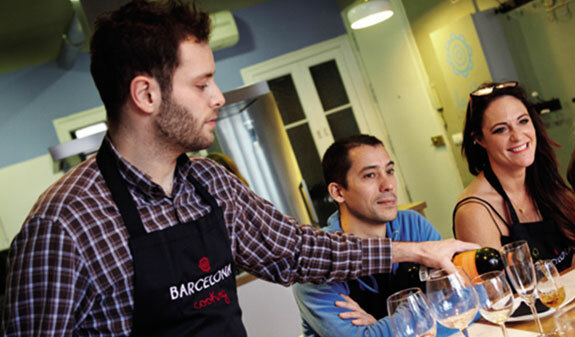 Cookery workshop where you'll prepare a menu of Spanish or Catalan dishes. Spanish D.O. or Catalan D.O wine tasting and food pairing. Workshop 1: Spanish cookery class. Monday to Saturday (except Wednesday), 10am to 2pm (includes visit to Boqueria Market). Monday to Friday, 6pm to 9pm (doesn't include visit to Boqueria Market). Workshop 2: Tapas and Catalan wines. Wednesday, from 10am to 2pm. Meeting point: Barcelona Cooking; La Rambla 58, 2 floor. Metro L3, Liceu stop and L1, Catalunya stop. Bus 14, 59 and 91. This activity is held in a building without a lift and isn't suitable for people with reduced mobility.